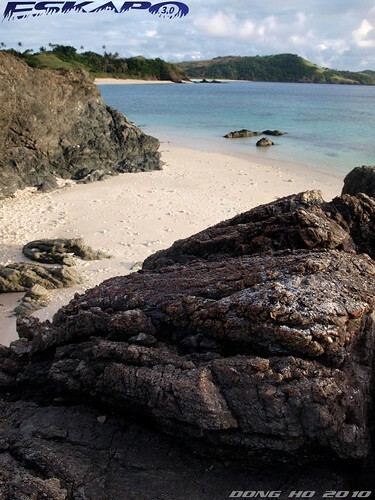 as one would say that beauty is in the eye of the beach-goer, i should say that Calaguas is exceptional. most of those who has been to these group of islands end up asking "how can be an island with no towering limestones, enchanting waterfalls, or even a resort be among the most loved island by those who've been there?" 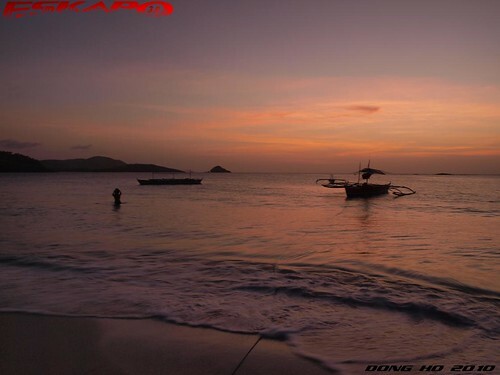 here are some of the few reasons why i love Calaguas. fresh catch. don't be surprised if someone will approach you and sell fresh catch fishes, sea crabs or in some case you'll have a first encounter. knowing that you're in an island two hours away from the big island of Luzon tells you that you're surrounded by open sea area. you can cook it or have it cooked by the locals. sunset. with a compass with you or the mere sense of knowing where the sun sets, you'll end up taking a great shot of the shifting hue sky. whether one wants a rocky foreground, a silhouette of boats or the hills, it's there. flora. there's much to see around the island if one really has the time to explore. the mangrove area near the fishing village of Mangkawayan is a great spot. one will pass by a cemented bridge under full grown mangroves that forms a natural tunnel. 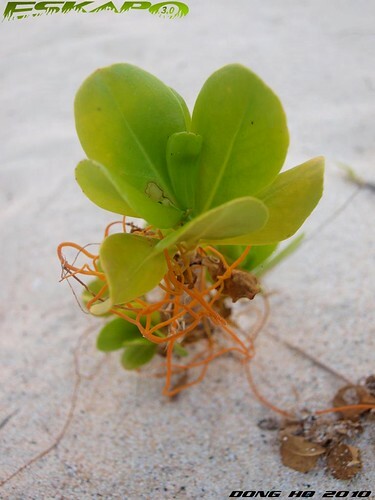 but if you have limited time, then take a worm's eye view of the beach plants and discover its variety. the locals. you need not to visit the village if you want to have a chat with the locals. once in a while you'll see the beach caretaker of each area roaming. engage them for a talk and you'll feel like they have all the time to answer your questions about their island life. what more when you drop by Mangkawayan village where you see the people find happiness over simple things. camping. imagine a cabana with white curtains and a crew serving cuervo. 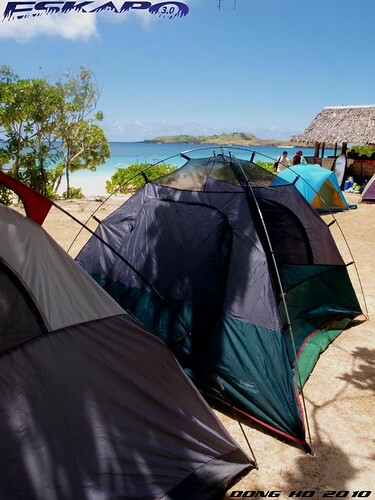 then imagine pitching your own tent, with the soft sand as your foam, the moon that partly brightens the camp and some monotonic insect sounds that puts you to sleep. bring your activity. there are no facilities like kayak, paddle boats, banana boats, or jet skis. when you go there, you bring your activity. 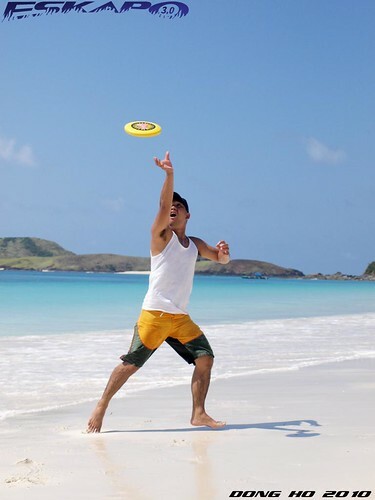 bring your own goggles, beach ball, skim boards or our group's favorite activity, frisbee. activities where you enjoy the place yet not exploiting the beach. island hopping. it can take you one whole day just exploring all the surrounding islands. from great green bushy hills, scenic rocky coasts, and uninhabited lands to almost unlimited areas for swimming, snorkeling, or shell picking. in other words, there's an island for every tropical-seeking spirit. the hills. 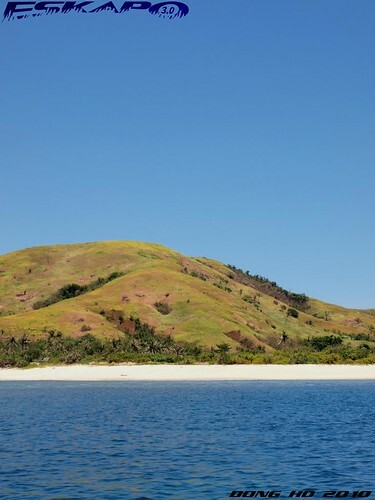 if there's something that adds character to these group of islands, it would be the hills. it's like seeing the Chocolate hills of Bohol in displayed in various size. runners, trekkers, and photographers will be awed by these green humps that forms the big islands. seclusion. 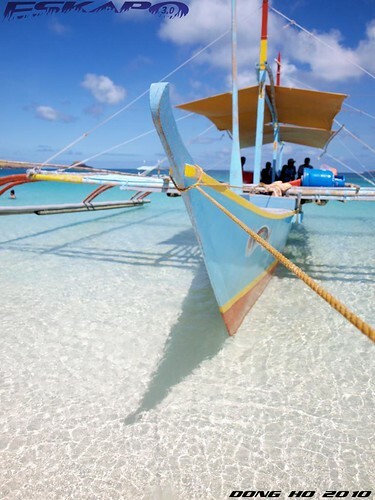 apart from being far from Manila, it takes a two-hour boat ride to reach these islands. expect rough waters during the rainy season as it is part of the typhoon route. no signal for your mobile phone and no resort to pamper a tired body. here, isolation can be your best friend. just choose your spot. the beach. there's nothing more to ask to a beach like that of Mahabang Buhangin. 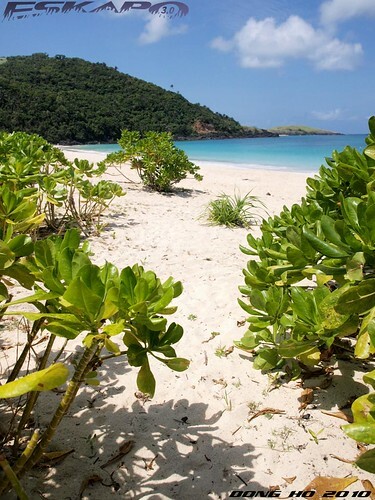 powder-fine sand, turquoise waters, and a backdrop of the other hilly islands. it is a beach like this that gave me the realization of how much an isolated island can be so beautiful. it is the best beach i've been to, so far. i'm sharing you just nine. i believe there's more to explore. there's more to adore. breathtaking in it's beauty. that's all i have to say. kahit sa pictures ko lang siya nakita. grabe, super inggit na ako. i want to be there the soonest, as in! I have always admired your Calaguas stories. And that makes me more and more eager to go and visit the place. I hope i can go there sometime soon. it is the best beach i've been to, so far. >hi luna, ill be there again next year. see you there. 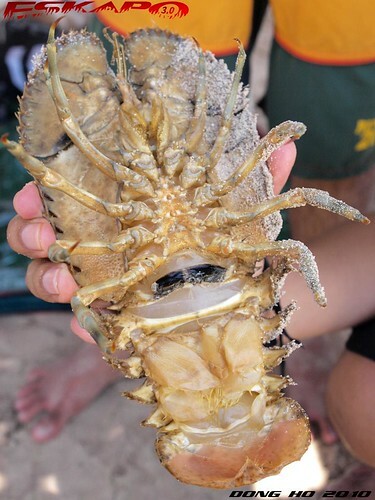 it's not the usual crab it looks something between a crab and a lobster. >gillboard, it is. what more when you're there? >james, just check the weather before you go there. >buhayprinsesa, yes. though it is still good to go there around this time as long as there's no typhoon. just avoid the months of august until november. >hi carlotta, yeah! let's see because im also planning to go there one more time this year. >potpot, enjoy! just make sure to check the weather before going there and rent a big boat. >hi sheng, thanks! you wont be disappointed. i recommend summer next year. >hi chyng, definitely. i know a list of people who also say it is. It's so pretty, really...It has a "Walden Pond" kind of atmosphere. I'd definitely go there. Thanks for the Vietnam stuff, i thought the little girl orange keyholder was perfect (repaired) and the cardholder is now being used. too bad you didn't give me your autograph.that would have been something. haha. The travel mag was a nice bonus! A remarkable place, and no doubt about it! So many wonderful and endearing reasons to make it worth visiting. Thanks for sharing. Please join this mini-contest for a chance to win a Real Home Ideas 5: Small Space Solutions book! i'm impressed and your post is so compelling that if i'm the president, i'll appoint you as DOT secretary -Calaguas branch if there's such a thing! LOL! i'm really craving to see these beaches you've been featuring. parang ayoko na umalis sa post na 'to. wala ko masabi kundi incredible! halos di ako makapaniwala sa sobrang ganda! Your Calaguas series is so encouraging. One of my relatives went there recently. Ang ganda nga raw. Btw, I just noticed that you've got a new domain. Congrats! Nice choice. masarap ba ang sea crabs? i love the fine, white sand. reminds me of my parents' hometown. i bet i would not have a good night sleep in a tent with all the insect sounds. it's just me, but who knows one day? You have great photos!! 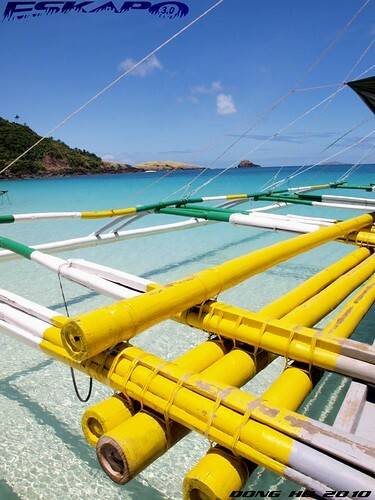 Hoping I could go to Calaguas someday..